I decided to get up and get a meal at the hotel restaurant — last meal before heading to the unknown. eggs, potatoes, a wonderful banana, bacon, and fresh orange juice. It was great. However, I was thinking to myself, “Self, you have an 8 hour bus ride to Haiti. What goes in must come out.” I’ll spare you the details. But, it was a concern. He was right. I sat near the front in assigned seat 12, next to a girl who told me right away, “No, English — none — no English. No talk.” That sounded like English to me. She was young, about 20 something. She was traveling to Haiti with several others — not sure if they were family or not. She did not enjoy sitting by me. Not sure why. She did have this thing for bees. She had a bee that kept crawling toward her on the window. She’s was afraid of it. But, she wouldn’t kill it. I tried to help her, but she wouldn’t let me. A tree hugger in Dominican Republic. The bus was nice. Air conditioning, quiet, good springs. It was comfortable. Men work on a load of food at the border. 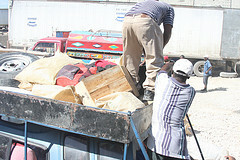 It took about 4 hours to get to the Haitian border. 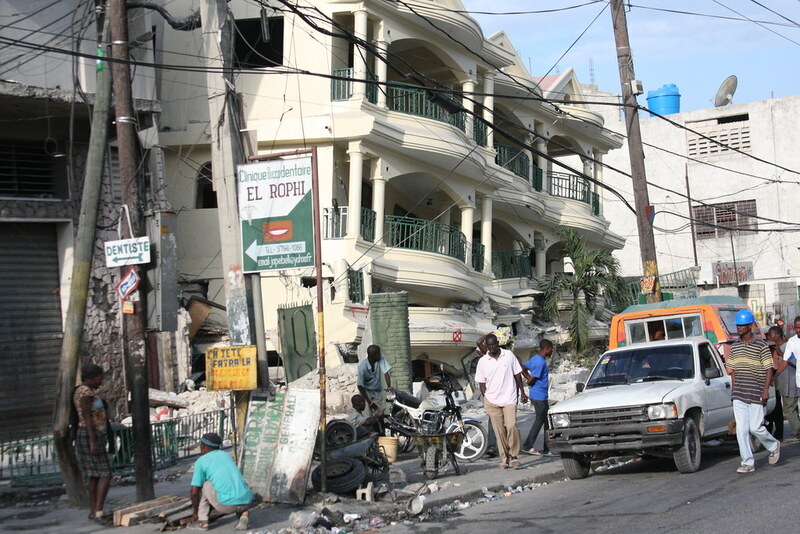 Woe, what a stark difference between the DR and Haiti. It’s like night and day. On the DR side, trees, grass, water, pretty flowers and everything you would expect in a tropical island nation. However, when we got to the border it was just the opposite. Like a wasteland. No trees. The lake was full of silt. Pollution everywhere. It was just awful. We made it to customs and it was chaos, at best. We were there two hours. Since I don’t speak the language, it was anybody’s guess what was going on. We finally made it in to Haiti. The roads — bad. 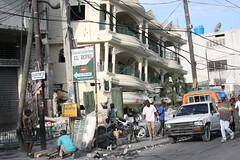 As we got closer and closer to Port au Prince we started seeing damage to buildings. As we finally made it to the bus terminal, I thought I had seen it all. But, I hadn’t been downtown yet. That’s when my eyes were open to the incredible amount of devastation. 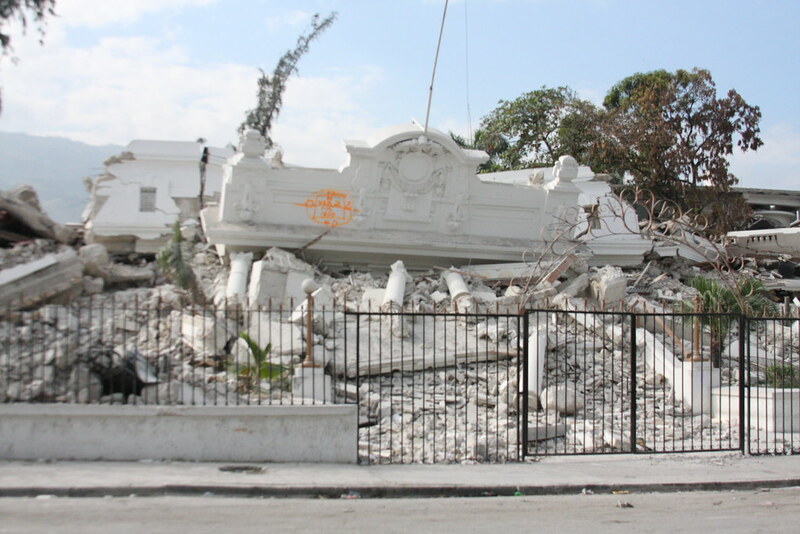 Everything the Haitians knew as their power structure has been destroyed. The Presidential Palace, Supreme Court and the Military. What’s great is Compassion International is there to help. No, they’re not doing it alone. They come along side the local church to empower THEM to do. Since they understand the community needs better than anyone, they uniquely qualified to identify the most needy. They’re the ones who become the heroes in the community, which gives them a platform to share their faith. Compassion International had 74 staff. Now they have 73. Of the 73 staff members, 15 of their family members lost their lives. 16 program staff (church members) lost their lives. 61 sponsored children and young adults lost their lives. 233 were injured. One staff member Eusua and his wife, lost his daughter. He told me, “I wasn’t even there. 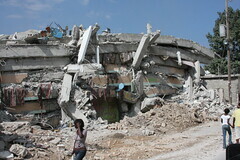 I was here working at Compassion when the earthquake hit.” His eye welling up with tears. He told me his wife was caring for his son and daughter when the quake hit. 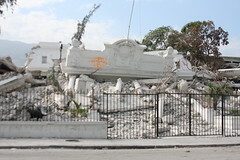 They survived the quake, “But when they ran away my daughter got away from my wife and a wall fell on her.” He asked me to pray for his wife who is taking it hard. Can you imagine having your son in your arms, your other child running for her life, only to be killed by a falling wall? Joshlyn Molone' with Dashna and Dashne, her nieces. On the ground stories like Joshlyn Molone ring throughout Haiti. 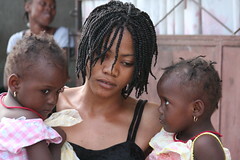 Her sister, mother of twin girls nearly two years old died in the earthquake. Now, Molone’, 21, will share the responsibility of taking care of her nieces with her 15-year-old sister. They’re now reduced to living in a tent outside the ruins of the girls’ home — a tent purchased by the twins mother before the quake. Rain is the enemy. With tent cities the only means of protection for those homeless will be ineffective. Typhoid, Cholera, and Malaria will take its toll on this population — 10-percent of which died in the earthquake. 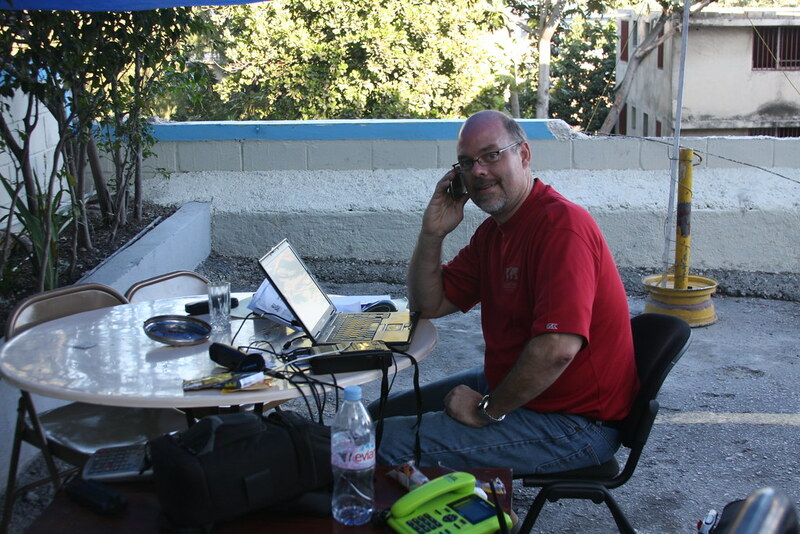 In Laogone, Compassion International sent a medical team in to help the city of about 10,000. Few medical teams had made it into the region. They were able to find many walking wounded, including a young girl who was injured in the quake. She was cooking at the time. A wall came down on her hand, pinning it in the fire. When she was rescued, her index finger was lost. From January 12 to January 30, this little girls has been among the walking wounded. 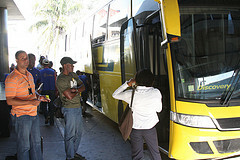 The team was able to get her to a hospital, and later evacuated to a hospital in Martinique. Greg speaking to WMBI Moody Radio Chicago. with one purpose, raising money to help Compassion International’s work in Haiti. The goal was to raise as much money as possible for the work of Compassion International in Haiti. More than 1,000 radio stations said they would participate. Some did more than others. But, all in all we were able to raise more than $1-million for the needs of the people of Haiti. Well, it’s been an incredible couple of days. 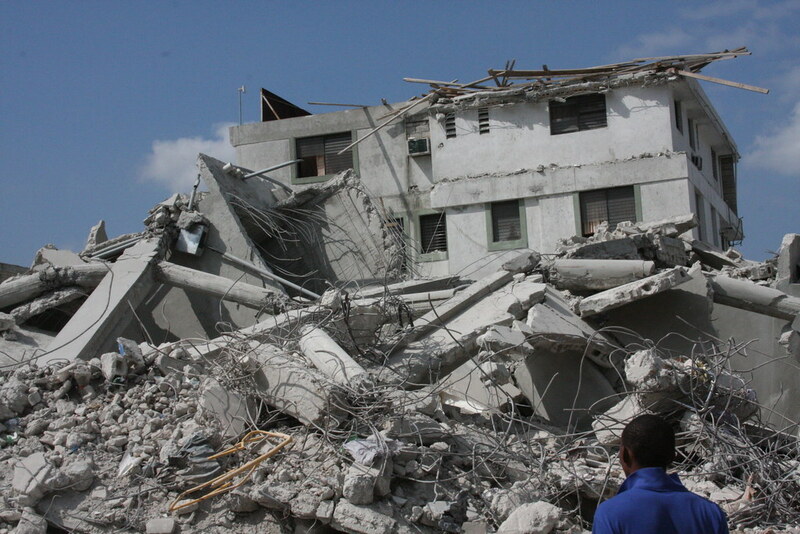 Keep praying for the people of Haiti. Equally as important — GIVE. http://www.HelpHaitiWithCompassion.org. Also, if you’d like to see pictures of my trip, click here. This entry was posted in Job, my day, travel by christianradio. Bookmark the permalink.